Happy Saint Patrick's Day! My dad's grandmother came over from Ireland and even though he doesn't care in the least bit, we like to celebrate with corned beef, cabbage, and carrots. 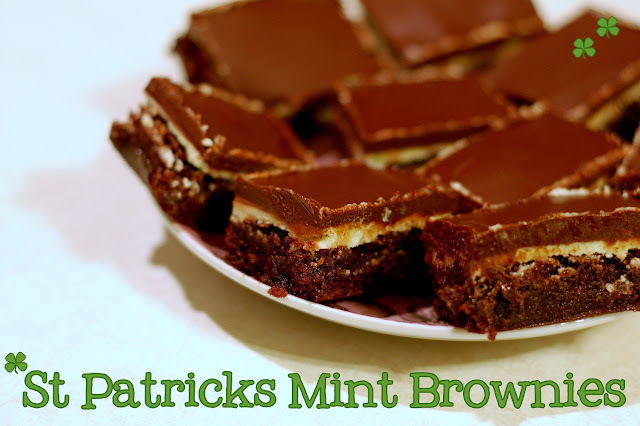 It's yummy once a year (haha) but I think we should add these brownies on to the tradition. I made them for the adults so I kept the green pretty low key but for next St. Patty's I'm going all out kelly green. You could change the extract and coloring, though, for a different dessert- almond, orange, or anything like that would be yummy. Though I must admit I'm super partial to the mint! I've been on a serious brownie kick lately. I love that you can top them, swirl something in, and vary your mixins to make a totally different end product. They freeze nicely, are easy to serve, and please everyone (minus my tall man who can't have chocolate!) These brownies look pretty impressive but are actually pretty simple. Line your pan with foil (both ways) so you can lift them out after they cool. Spread on your mint frosting (this would be a good use of leftovers- I know I usually have some after I make cupcakes), let it set, and spread on your chocolate. Not a lot of hands on time but really these brownies pack a lot of deliciousness. Cut them with a hot knife and clean it in between strokes to get prettier brownies than me! I like to cut them into one and a half inch pieces and put thm into cupcake wrappers. Set them on a nice platter and people go crazy. Yum. One 9 x 13 pan of Brownies, cooked and cooled (I like to line the pan with foil before I grease it, then I can lift them right out after they cool. Peel off the foil for a nice, neat sheet of chocolate deliciousness). Cream butter with 1/2 the powdered sugar until well incorporated. Add the remaining sugar and milk until desired consistency is reached (it should be light and nice and spread-able). Add extract and coloring to taste. Spread over cooled brownies and refrigerate. Make a double boiler but setting a heat proof bowl over an inch or so of simmering water. Slowly melt the butter and chocolate, making sure to remove from heat just before the chocolate is completely melted. Stir until smooth and pour over cooled, frosted brownies. Place in freeze until firm and cut into small pieces. Yum! The combo of chocolate and mint is such a classic. It is right up there for me with chocolate and orange. These look wonderful. 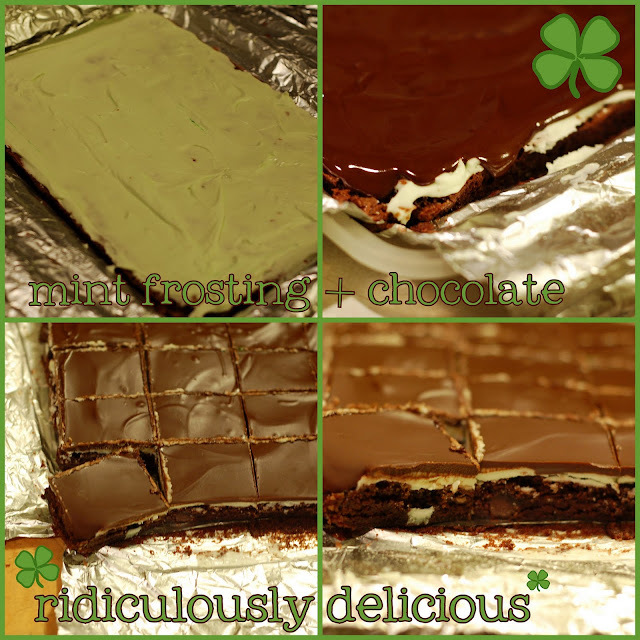 I needed a good mint brownie recipe. Thanks! These DO look ridiculously delicious. My favorite brownies ever. I still Remember Linda Buchanan making these for my bridal shower. oh my! Those look amazing! Wow...what a yummy blog you have! These are quite a treat with the mint filling. They look good, too. Oooh I love mint chocolate anything! !